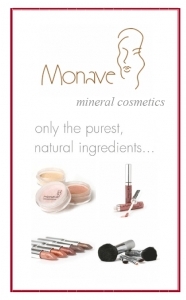 Monave provides books on makeup application as well as catalogs in both printed and PDF downloadable versions. The Monave Mineral Makeup Book is a joint effort between Andi Bradshaw, distinguished makeup artists and author, and Deborah Bilezikian, owner and founder of Monave Mineral Makeup. Our catalog, printed and mailed to you. If you purchase the catalog in this format, it will be mailed to your shipping address. Our catalog, as a downloadable PDF file. If you purchase the catalog in this format, the email confirmation of your order will contain a link. Clicking the link will allow you to download the PDF.